The Black Ice printer driver v13.20 now supports a total of 177 predefined paper sizes, including large format and label printer paper sizes. Variable paper size options have been removed, instead custom paper sizes can be easily added through the printing preferences or the INI file before installation. 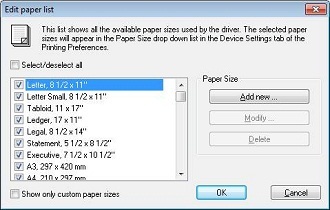 List of Supported Paper Sizes: There are 176 paper sizes as well as a FAX specific paper size. The page sizes range from envelopes to large E size pages including A0 Engineering paper size. The paper size can only appear in the "Paper list" drop down menu if it is selected in the "Edit Paper List" dialog. The default paper size depends on the Windows Regional Settings. In USA, Canada, Mexico, Philippines, Chile the default paper size is Letter, for all other countries the default paper size is A4. Avery 9177 1/2 x 1 3/4"
Avery 9173 2 1/8 x 3 1/3"
Avery 9170 1 x 2 5/8"
Avery 4153 2 1/8 x 4"
Avery 4150, 4151 1 1/8 x 3 1/2"
Avery 9176 11/16 x 3 7/16"
Additionally, the Black Ice printer drivers allow unique paper sizes to be defined in pixels, mm or inches. The maximum paper size is 129 inches x 129 inches. Custom Paper sizes can be added through the INI file. The entries must be in the “paper size definition” section of the INI file. When adding a custom paper size to the list, the “number of Paper sizes” entry must be increased accordingly. When defining a custom paper size, its WindowsPaperCode must be set higher than the current highest WindowsPaperCode in the paper size list. Recommended value is above 335.